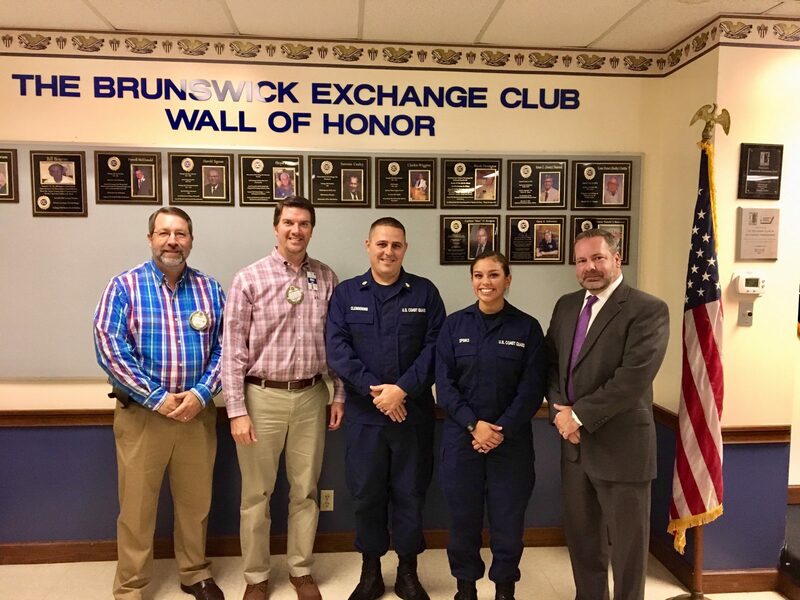 The Exchange Club of Brunswick hosted BM1 Chris Clendening and Seaman Fallyn Spinks of the U.S. Coast Guard Brunswick Station at a recent meeting. 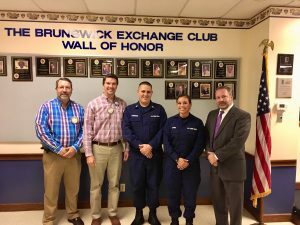 They told the club about the Coast Guard Station Brunswick. They spoke about the training, mission and day to day operations, like search and rescue missions. They have two boats to perform their missions, a 29 foot and a 45 foot. Their area of responsibility is from the tip of St. Katherines Island to Kings Bay. Pictured from left to right are Pres. Kevin Higgins, Vice Pres. Mike Lynch, BM1 Chris Clendening, Seaman Fallyn Spinks and Secretary Allen Phillips.